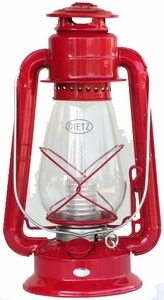 This battery powered version of the Dietz #20 Junior lantern features a 6 LED horizontal cluster and operates on 4 AA batteries. Perfect for lantern applications that prohibit the use of open flame. Features a three wick raiser switch for 1 LED and 5 LED operation. Not for use in damp locations.